May 26th 1927; Henry Ford and his son Edsel drive the 15 millionth Model T Ford out of their factory, marking the famous automobile's official last day of production. After production officially ended the following day, Ford factories shut down in early June, and some 60,000 workers were laid off. 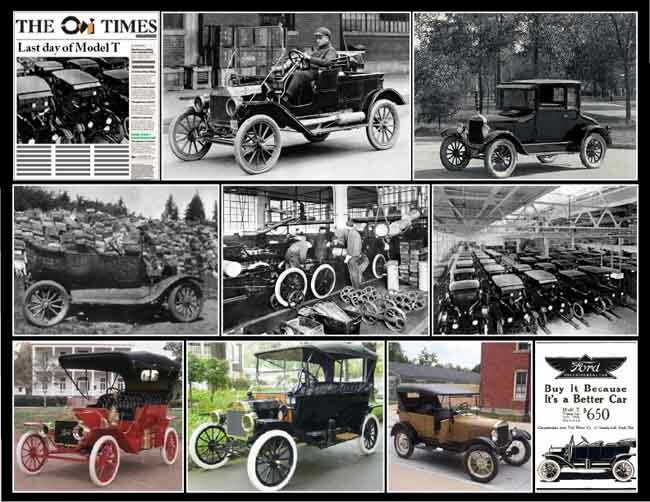 The company sold fewer than 500,000 cars in 1927, less than half of Chevrolet's sales. The Model A's release beginning in select cities that December was greeted by throngs of thousands, a tribute to Ford's characteristic ability to make a splash. No car in history, however, had the impact—both actual and mythological—of the Model T: Authors like Ernest Hemingway, E.B. White and John Steinbeck featured the Tin Lizzie in their prose, while the great filmmaker Charlie Chaplin immortalized it in satire in his 1928 film "The Circus."